The town of al-Wakra is said to have been founded in 1828 but had fallen into disrepair having been abandoned, I have been told by people living there, after the Second World War. This was not the first time, however, as it was also abandoned in 1838 and returned to by its inhabitants in 1842. This first overhead aerial photograph was taken, I think, in the early 1950s. The sand bar protecting the town is highly visible in this photograph. A large maqbara is clearly seen left of centre and it is also noticeable that there are what appear to be abandoned buildings to the north. Development on more orthogonal lines is suggested on the west of the town but the older development nearer the coast has a typical, random structure to it. The state of dilapidation, seen in the photographs below, suggests that it is likely to have begun to fall apart well before the time these photographs were taken. The oblique aerial photograph shows the town with the road to Doha leading out of the top of the photograph and the square shape of the fort visible in the centre. The sand bar which was beginning to create problems for the boats can be clearly seen on the right. This was an important settlement in terms of its architecture reflecting, I assume, something of the character and importance of those living there. 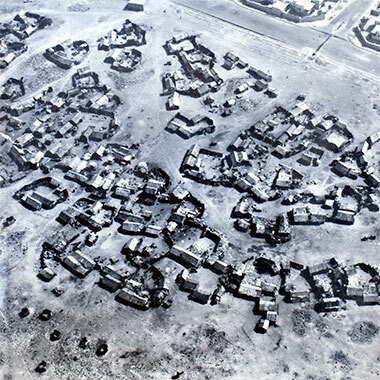 These two aerial photographs of al-Wakra show a little more of the character of the town. In the first, taken from approximately the south-west, you can see one of its important features, the sand bank which created a natural harbour but which, I understand, slowly restricted its use. In fact, nowadays there is a long jetty to the right of this photograph enabling access to deeper water. I guess this photograph was taken in the nineteen seventies, though I am not sure. It certainly shows a dual carriageway road moving north-south and was the road connecting Doha with the industrial city and oil loading port of Umm Said. The second photograph was taken in 1976 some time after the town was abandoned. Fishermen were still operating here with boats pulled up onto the foreshore and a stone fish trap visible. It is particularly noticeable that the buildings have their major openings, both at ground and first floor, open to the east and sea. 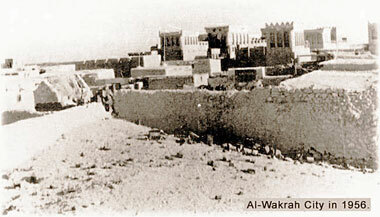 Here are two photographs of the old town of al-Wakra, situated a few miles south of Doha, the first looking north-east. The lower one you can see to be dated 1956, so it is evident that it had been abandoned by that date. However, I can recall people living in al-Wakra in the early nineteen-seventies, and making a small living from fishing, though many were moving to the security of government employment in Doha. From the evidence of what remains it appears that al-Wakra was a relatively well-off town. Some of that wealth will have come from pearling. I don’t know why al-Khor should appear less well-off as I believe that pearling used to be its main industry. But the buildings at al-Wakra, both in their arrangement and decoration, were some of the best in the country, though also architecturally different. It is interesting to see that there is an ’arish, a pitched roofed building which would have been roofed with palm fronds in the foreground. In the first two photos you can see a little of the character of the buildings. There were many two-storeyed houses, most of them facing the sea and turning their backs on the west and its hot, afternoon sun and the shamal, protected by badgheer which allowed cooling winds to flow through the building and were capable of being closed in the event of rain or dust storms. The buildings would have taken advantage of the diurnal air movements that flowed from the sea towards the land in the mornings. 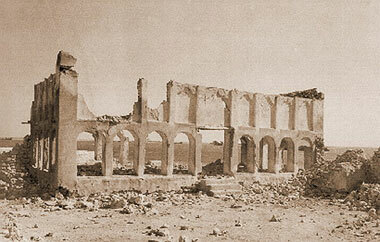 This photograph was taken in 1908 by Major Percy Cox, the British Political Resident in the Gulf, and is a very early illustration of the qal’at at al-Wakra. While there is not a great deal of detail visible, there is sufficient to show that it was taken from around a hundred metres to the east of the qal’at with, on the right and to its north, the masjid of Sheikh Abdulrahman bin Jassim al-Thani, the head of that part of the al-Thani family. The masjid, unusually, appears to have four bays rather than an odd number as the latter permits the mihrab to fall in the centre of a bay rather than on a column line. The photograph also suggests that there was only a single circular tower at the time of the photograph, that being in the north-west corner of the qal’at. Elsewhere I have mentioned the town of Rayyan as being one of the centres where members of the al-Thani family settled. 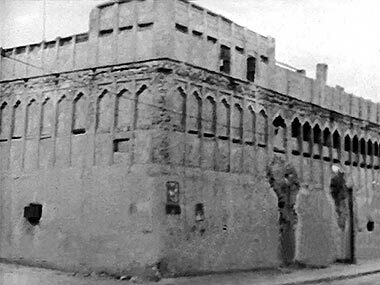 Regrettably I have no old photographs of al-Wukair where there were also members of the al-Thani family living, but this photograph is likely to be of one of the al-Thani residences in Rayyan. I am unable to say anything about the orientation although shadows are being cast from the right suggesting the photograph was taken from the southern or western sector and that the settlement was a very small settlement in 1937. This area to the west of Doha is today, and was then, a favoured area of the peninsula where the al-Thani family located a number of their settlements. Here you can see how the families dispersed around the arable land in that area, particularly grouping themselves next to the large enclosed structure which can be seen in the centre of the photograph. There appears to have been excavation in the area, but I have no idea what it might have been. 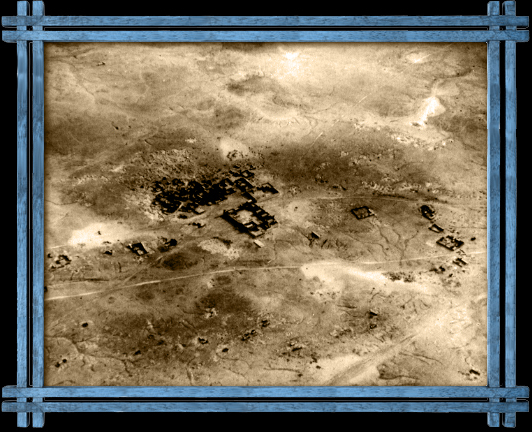 Bear in mind this was only seventy years ago at the time of writing – or just two generations… By way of contrast, the second of these four photographs is an oblique aerial photograph taken in the mid-1960s, looking approximately west over Rayyan. The fort is on the right, a Royal residence on the left. The road leading out of the top of the photograph leads past al-Wajbah to Dukhan on the west coast of the peninsula. The third photograph shows the entrance to the residence of a previous ruler, Sheikh Ali bin Abdullah at Rayyan, I believe in 1966. Since writing the above note I have come across an even earlier aerial photograph of Rayyan. Taken in May 1934, looking approximately north-west, it can be compared directly with the photograph above which is also taken in a similar direction. Having looked at the two images carefully it is apparent to me that they are not of the same development. Certainly the 1937 image is not of the fort which, three years previously – as can be seen in this photograph – had been a well developed and larger grouping. The 1937 image was found on a government site, but has since disappeared – though it can be found again with a reverse image search. Regrettably there is not enough detail in the photograph to learn much from it. Click on the 1937 image to view the original government web image in a separate window. For orientation, Doha is some way off from the bottom right hand corner of the photograph with a track visible leading between them – around ten kilometres as the crow flies to the al-Kut fort. The fort at al-Wajbah is around three-and-a-half kilometres to the west – out of the top left corner of the photograph. 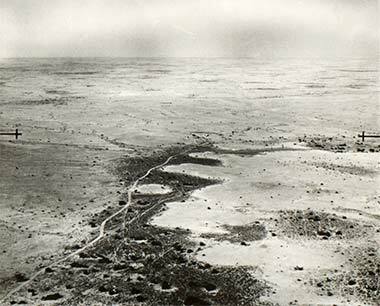 This is a clear view of the fortified development at Rayyan at that time, five years before the start of the Second World War, a war that delayed the development of the oil fields of the peninsula and, therefore, the State. There are circular towers on its south-east and north-west corners as well as another circular tower on the north-east corner of the northern extension. The main entrance to the development is from the south, left in the photograph. The first of this group of photographs was taken from a British Royal Air Force flight, early in the morning in May 1934. It looks approximately north-west over the East and West Bays of Doha with al-Khalifat nearest to camera, then al-Hitmi, al-Salata and, distant left, Doha with al-Bida beyond it, both facing the West Bay. That part of the littoral in the foreground, al-Khalifat, was given over to the drawing up of traditional craft. Fishermen’s housing was situated immediately behind it along with a masjid and sitting areas, majaalis, some of them existing into the 1970s. The palace development of Sheikh Abdullah is in the centre of the photograph, constructed on slightly rising ground with a number of traditional craft drawn up on the foreshore. This slight promontory is probably the reason that the palace was constructed on that location, around a kilometre and a half from the centre of Doha. These next illustrations are here to show something of the setting of the development at feriq al-Salata associated with Sheikh Abdullah bin Jassim al-Thani. All four illustrations are from 1952. Note how the settlements lead east along the coast from Doha with the furuwq of al-Salata, al-Hitmi and al-Khalaifat. It should be noted that some members of the al-Thani families lived within these furuwq, presumably due to the location of Sheikh Abdullah. It seems not to be known why this development was located at feriq al-Salata. Members of the al-Thani qabila lived in a variety of places on the peninsula prior to the turn of the twentieth century. Many of them lived in the north of the peninsula but it is likely that with the increasing importance of al-Bida and Doha and, perhaps, Wakra, it might have seemed logical to move to the centre of international activities which was becoming centred at Doha. The peninsula was surrounded on the west by low waters and the north had significant historical difficulties associated with Zubarah and Bahrain. The east coast enjoyed deeper water and, at Doha, was the location selected by many of the merchants to base their commercial activities and, perhaps as a consequence, by the Ottomans who made it their main policing station. 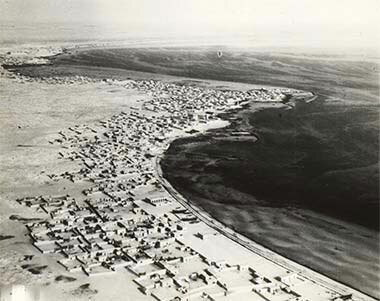 The site at feriq al-Salata was selected as being immediately adjacent to the sea in the east bay of Doha and was situated at the edge of the feriq occupied, particularly in the north peninsula, by the al-Sulaiti qabila. It can be seen in the central map that it is immediately north of feriq al-Hitmi, the area occupied by that family both of them associated with fishing, pearling and maritime activities. South of its south-east corner was a small masjid which would have catered both for the needs of Sheikh Abdullah as well as those living near him. Interestingly, the land is relatively low at this point and a significant distance from the centre of Doha to its west. Later, of course, the development was abandoned and the seat of the al-Thani moved to the west of the centre of Doha, onto the higher, more commanding and strategically important site where it now stands. 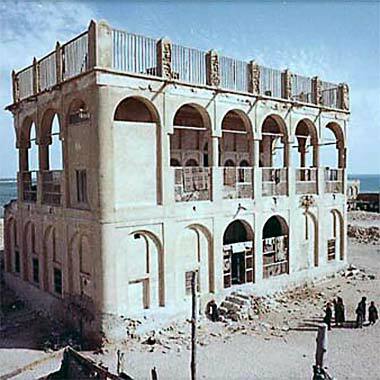 These first four photographs, all taken around 1971, illustrate something of the state of repair of the the buildings constituting Sheikh Abdullah bin Jassim’s development in feriq al-Salata at that time. At the beginnings of the 1970s the Government determined they would create what would be named the ‘Qatar National Museum’, so preserving the original development – or incorporating as much of the original buildings as practicable – and changing the character of the complex from one which reflected the family’s domestic and national organisational requirements, to one suited to the organisation, collation and display of artefacts of national interest and importance, while catering for access by the public for their education and enjoyment. The original grouping of buildings was revised to incorporate a new structure on its north side which would house offices and the artefacts illustrating something of the history of the country, a number of buildings and walls were taken down and the more important buildings repaired or reconstructed as near as possible to their original form and detailing, and with the introduction of electricity, an issue which engendered considerable debate. This lower photograph, taken of the end wall inside one of the more important rooms of the complex, is perhaps atypical in the greater extent of the damage caused by vandalism. Sadly, much of the traditional naqsh in this and other buildings throughout the peninsula has been lost this way, taking with it our understanding of the character and range of patterns used. Interestingly, the pattern of decoration of the external face of the wall can be seen through the broken naqsh panels. With the exception of the photographs above, the next group of photographs was taken from two sources, one of them an old government publication on the Qatar National Museum. They date back to the 1930s and illustrate something of the old complex of Sheikh Abdullah bin Jassim bin Muhammad al Thani. 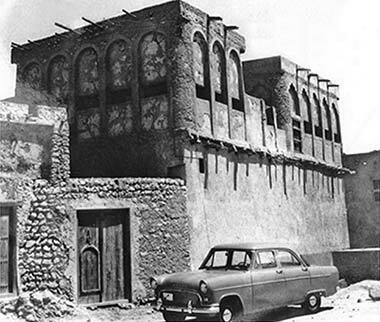 Generally referred to as the ‘Old Amiri Palace’ the development was refurbished, mostly accurately and sympathetically, but with the addition of a new building and surrounding wall for security, to serve as the Qatar National Museum in the early 1970s. The site, and the buildings within it, are located with the long axis of the site approximately in line with the holy city of Mecca – a little south of west – and most probably a deliberate decision. Sheikh Abdullah established the development for his family around the beginning of the twentieth century some distance to the east of the centre of the small conurbation which was Doha. The development was associated with the east bay of what is now Doha. This period of Qatari history had much to do with the competing British and Turkish interests in the Gulf, one of the routes to the Far East, particularly the Indian sub-continent and China. The Turks established themselves in the peninsula with a presence both at al-Bida, north of Doha, but also on the high ground to the south-west of the Doha suq and residential development. The ground between the suq and their qal’at al askar was given over to a maqbara, I suspect a way of keeping relatively clear ground in front of their fortified position. Something of the north gate house of the residential compound is illustrated in tis next group of four photographs, the first three probably taken around the same time, the first colour photograph having been made in the late 1960s looking down from the central two-storey structure in the middle of the compound. While the palace complex was essentially a residential development, the history of the times suggests that it was necessary to provide a significant degree of protection in mind. The fourth photograph was taken in March 1972. The gate house structure shows a form of control over anybody entering, constraining the passage in depth – the structure being in the proportions of 2:1 on plan – rather than allowing entrance straight into the compound once through the external gate. The lowest of these three photographs shows the side of the public majlis situated in the north-east corner of the compound. These photographs illustrate a little of the character of the region at that time, with influences of both the Najd hinterland as well as that of the Gulf littoral where the influence of sea breezes and environmental considerations are reflected in the structure, character and detailing of architectural designs – the development having been designed by the Bahraini master builder, Abdullah bin Ali al-Mail. In particular, this form of architecture integrates structure, environmental and decorative treatments to a considerable extent. Despite the Bahraini influence the character is, however, Qatari, with slightly finer elements used in their construction compared with the heavier styles of the hinterland. This photograph also shows the north gate to the compound, this time viewed over the building knowns as the little majlis, which also was the coffee reception hall, an important element relating to hospitality and the public majlis. To the right of the photograph is the public apartment associated with the north gate house. 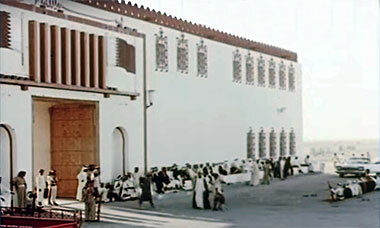 The four elements of the north gate house, the east gate house, the coffee majlis and the public majlis constituted the main elements of the compound associated with the public functions of Sheikh Abdullah. There were three entrances to the residential complex of Sheikh Abdullah, I believe, these being on the north, east and west sides of the surrounding wall. The subsequent development of the complex into the Doha National Museum must have amended this to create an entrance on the south side, while omitting the west entrance. The first two photographs show the east entrance from within the compound, this opening in fact facing north-east, looking at it from the south, the gateway facing directly onto the central two-storey structure in the centre of the compound. Given the importance of this gateway, it may seem a little surprising that it bears only minimal decoration with a small number of carved roundels and lineal decoration outlining the arch. The second photograph gives an indication of the carving of the architrave and six rosettes, while within the gateway can be seen a naqsh panel, unusually a triangular framework with a central rosette. The third photograph is a general illustration of the entrance from outside the compound, facing north-east to the sea. It should also be borne in mind that Sheikh Abdullah, as the Ruler of the country, was involved in affairs of State, commercial dealings as well as social and cultural issues. In this he brought to this development many of the social characteristics of the badu, creating a complex that, within a wahhabi tradition, would have been surprisingly open with women having considerable freedom within this complex. Around 1923 Sheikh Abdullah left this development and moved to the other side of Doha where he developed a larger palace complex on the high ground overlooking Doha’s suq to its east and shown on the previous page. This group of photographs illustrate how the group was allowed to deteriorate. The first and third photographs were taken around ten or fifteen years after he left, the lower three most probably in the late 1940s. That above shows the western entrance structure to the compound and was located in the west wall adjacent to the majlis which was in the north-west corner of the complex. 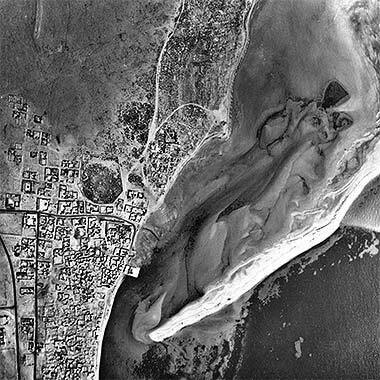 This sepia photograph, an enlargement of a small image, is an aerial photograph taken from the north, approximately the reverse angle of the photograph above it. The photo shows the northern corner of the complex with the north and east gate structures clearly visible. By the time this photograph was taken, it is interesting to note that there is development relatively close to the eastern wall of the compound, presumably because Sheikh Abdullah had moved to the new development west of Doha. The photograph also illustrates the character of the complex with single-storey buildings contained within a surrounding wall and a tall, two-storey building at its centre where he and his family lived, other buildings being lived in by the families of Shaikhs Hamad and Ali, and supporting the life and work of Shaikh Abdullah. Taken from the reverse angle from that of the sepia image above, this next photograph appears to have been taken a little later by the evidence of the state of the buildings within the complex. It shows that the beginnings of a fill operation have started on the littoral. This was the start of the decision to clean up the foreshore which displayed a natural mixture of sand, rock and coral and where boats were traditionally beached. With time the area where the sea is in this photograph was filled in and the Corniche started. This exercise beginning in the early 1970s. Sheikh Abdullah developed his complex as a discrete compound, partly fortified with high walls and watch towers as was the custom in the region. In the centre were his family’s living quarters and, on the north-west corner a majlis or meeting room where he was able to carry out affairs of state as well as his personal business. In those days there was about a mile between the centre of the suq and Sheikh Abdullah’s development, situated at the north end of feriq al-Salata, the land traditionally belonging to the Sulaiti qabila. With time the development was enlarged to provide houses for his two sons, Sheikh Ali and Sheikh Hamad. This development served not only as his family’s home but, in the traditions of the area, as the centre of his work as governor of the peninsula, the Turks having left in 1916 and the British taking their place. These two photographs show something of the palace complex of Sheikh Abdullah as it was in 1960 over some of its surrounding buildings in feriq al-Salata. The views, looking approximately north and north-west respectively, show the haphazard urbanisation to the south of the complex as well as its relationship with the sea. Many of the family who inhabited this feriq – as well as the feriq al-Hitmi, adjacent to and south of the complex – were associated with the fishing and pearling industries. By this time Sheikh Abdullah had moved to the other side of Doha and his complex had fallen into disrepair. Apparently, much of the surrounding area has also been abandoned by the time this photograph was taken. The irregular configuration of the coastline is evident, a masjid can be seen on the cost behind the complex. This photograph is taken looking approximately in the same direction as that above, gives a better idea of the location of Sheikh Abdullah’s palace complex in context not just of feriq al-Salata and feriq al-Hitmi, but also with respect to Doha which was developing to its west. The area in which the Port was beginning its development can be seen, its location being fixed by this point being relatively close to deep water – although dredging still had to be carried out to make a safe channel to the extended port. I don’t know what the large area in the right foreground was. If anybody does, I’d be grateful if they would let me know. It was taken in the 1960s. Members of the family of Sheikh Abdullah also had their own quarters and lived within the compound, there also being a masjid outside and to the south of the south-east corner of the walls which would have served their religious needs as well as of those who were living around the complex. 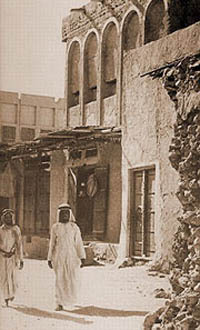 This first photograph is of the west, external facing, façade of the living quarters of Sheikh Ali bin Abdullah. Situated on the west side of the complex, the tower formed, in effect, the north-west corner of the overall compound. Note the considerably sized terrace at first floor level which would have been used particularly on summer nights when it was more comfortable to sleep on the roofs rather than in the hot interiors of the buildings. The lower photograph looks at at the same corner, but from the north-east. The central building in Sheikh Abdullah’s complex was a two storey formal structure, photographed here as it was in 1967 in the top photograph and, perhaps, in the same year for the lower photograph. The two photographs show the south and west faces of the building respectively. This was the family residence of Sheikh Abdullah, supplemented by a group of rooms arranged around the external wall of the complex and to the south of this building. 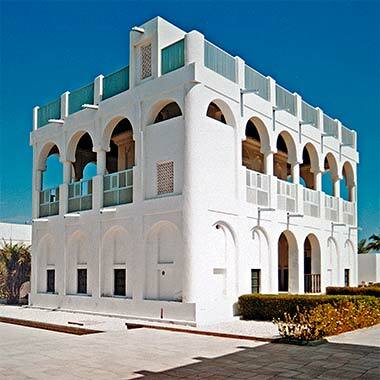 Constructed for Sheikh Abdullah in 1918 by the Bahraini master builder, Abdullah bin Ali al-Mail, its architecture based on contemporary modern buildings in Bahrain. Its design importance lies in its central location, a building of height to be experienced in the round, as well as in the logical disposition of its rooms around a central space on two levels, the lower having rooms or covered spaces, the upper constituting an almost continuous gallery. Its location within the compound together with its height will have allowed it to take advantage of the littoral sea breezes, in a similar manner to which the public, single-storied majlis, located in the north corner of the complex, was able to provide to those sitting within it. This next group of photographs might not be considered suitable for this page but are thirty-eight years old at the time of posting. The purpose of placing them here is the obvious one – of direct comparison with the earlier photographs. They were taken just after the restoration of Sheikh Abdullah’s compound with its reinvention as the Qatar National Museum, which opened in 1975. Unlike many of the smaller buildings on the site, this central structure lasted relatively well from its construction to its reconstruction almost sixty years later. Designed on a grid of six by four bays, this allowed the central majlis to be two by four bays in its proportion. No amendments were made to this basic form other than the addition of an enclosure at the top of the stairs giving access to the roof. It has been explained elsewhere that the ceilings of rooms were generally left with their essential construction exposed, some care being given to the interweaving of the visible elements, with some of the canework being painted with the primary colours then commercially available. This was particularly true for the hassira and basjeel elements of the ceiling, and gave rise to the typical linear or criss-crossed patterns found above the structural shandal beams, some examples of which can be seen on another page. Contrasting with those examples, these two reconstructed ceilings were photographed in, respectively, the ground and first floor rooms of the central structure in Sheikh Abdullah’s complex at feriq al-Salata. As such they replicated what had been there previously in terms of their structural vocabulary, with trimmed boards used to hide the ceiling construction and being subsequently decorated with paint. More importantly they illustrate the top end of the design market in those days as the flat timbers used to close in the ceiling structure were expensive. Some levelling through of the structural, but usually irregular, shandal beams was necessary in order to obtain a level ceiling, with the ceiling beams running the length of the space at right angles to the shandal beams that spanned the shorter distance between the long walls of the space. 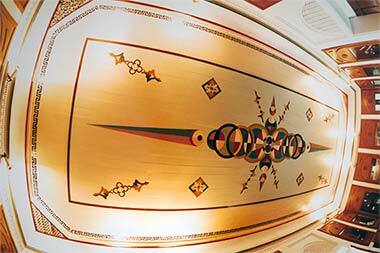 The ceiling boards were finished with gloss coats of paint and then decorative patterns were applied. As can be seen, the patterns are not those you might anticipate in the peninsula, that in the first floor ceiling appearing to be from a completely different mindset. 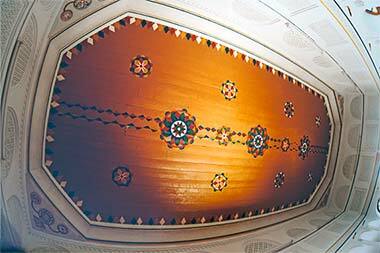 At first glance the geometry behind the three main rosettes in the ground floor ceiling appear to be similar to the simple naqsh panels seen within the building and others in and around the complex – yet, they are not. None of them is regular and, while the centre of each is divided into ten, the next circles have seventeen parts, and the outer geometry twenty. It is difficult understanding why this should be so. There is a little more written about these geometries on one of the geometry pages. The triangles in the corner of the ceiling have four circles, the main one having seven divisions, two of the others have four and the last has six divisions. Contrasting with this, the first floor ceiling has little in the way of a coordinating geometry but appears to have been designed by somebody with no understanding of the design history of the peninsula. Both these ceilings were completed in the early 1970s. Compared with much of the developments refurbished later, the exterior was kept free of naqsh embellishment, a decision which enables the building to retain much of its feeling of strength in its massing. The columns with their screened bases and arches are visually strong and contrast strongly with the more delicate inner wall with its windowed openings and naqsh panels as can be seen in this view down the long side of the first floor verandah. Regrettably, though perhaps understandably, most of the original naqsh panels were destroyed through vandalism. Even more sadly to me, this meant that the geometric patterns of the panels also disappeared with the consequence that the knowledge of how they were set out being lost to us. This first photograph shows one of the ends of the main room and illustrates the extent of the damage. When the decision was taken at the turn of the 1970s to create the Qatar National Museum on the site of Sheikh Abdullah’s compound, the new buildings housing the museum and its artefacts were inserted as an intervention on the west side of the grouping where it was considered that the least change to the existing grouping would be made. Although the original main two-storey structure was standing in the centre of the complex, much of it was stripped back in order to safeguard the reconstruction. In the first of these two photographs, both taken in March 1972, the original juss and hasa can be seen to be reinforced by the use of cement on the lower levels of the main structure. The lower photograph illustrates work on the development mid-way along the south wall of the complex. Not only was cement used in the construction of the building but it was also part of the mixure used for the naqsh panels decorating the walls of the two main rooms of the building. Here, in a photograph taken in 1972, workmen are still engaged in the process of modelling the walls while naqsh panels have already been incorporated below their work. Notice that the corner of the ceiling has yet to be added. Here is a view of part of the finished room taken just prior to its formal opening in 1975. This is, I was told, an honest reconstruction of its original form and decoration – with the exception of the fluorescent strip lights visible at the high level. The issue of introducing electrics in both the forms of lighting and air-conditioning into traditional buildings was a problem for many of the builders who, generally, felt it to be anachronistic. The issue is considered elsewhere. This photograph shows the remains of the public majlis of the complex, the formal meeting room in which the men of the family would meet, discuss and make decisions on a daily basis. It was the public face of the Sheikh Abdullah. It appears to be relatively low due to the construction above the panels being missing. It was situated in the north-west corner of the complex, this photograph having been taken from inside the complex to the north-west. It is the nearest building in the square sepia photograph a little way above, and can be glimpsed in the photograph above that one over the entrance structure. Seen a few years later, at the end of the 1960s, the east bay and early form of Doha’s port can be seen above and through the public majlis in these two views. The port development effectively defined Doha’s east and west bays. The close proximity and relationship of this north end of Sheikh Abdullah’s complex with the sea is particularly noticeable, and those using the majlis with its shutters open would have been able to enjoy both the view and the littoral breezes coming off the water. Regrettably, as was the case with many of the old, abandoned buildings, a significant amount of damage was done to the naqsh plaster decoration inside the rooms. This photograph of an interior corner of the majlis shows how the panels were placed in pairs within the structure of the building. The form of the structure is plain to see and formed the basis of most buildings in Qatar. It is of trabeated, or column and beam construction, the columns being provided by hasa, desert stones set in a juss limestone mortar with horizontal timber beams between them. Elsewhere i have written about this in more detail. Decoration has introduced non-structural round-headed and ogee arches, but these are purely decorative and act as relief and contrast to the rectilinear construction. They make no structural contribution to the structure. This pair of photographs were taken in the 1960s, I believe at al-Salata, and show a little more of the character of the development to the east of Sheikh Abdullah bin Jassim’s complex, adjacent to the sea. The first looks along the coast towards a masjid that sat near the sea to the south-east of Sheikh Abdullah’s compound. The local craft have been pulled up onto the beach for protection and, perhaps, maintenance. The lower photograph looks inland from the sea and illustrates a typical street, notable for its width. In the foreground is a craft I believe to be a shuw’i, similar in many respect to that illustrated here, but with a noticeably different prow. The houses are simple structures lived in by those making a living from the sea and, in the distance, a pitched barasti roof can be seen protecting a building. Finally, here is a photograph of an old masjid at feriq al-Salata. It has the characteristic features of the old masaajid of the peninsula with its short, stubby manara with its heavily battered sides and a six-divisioned opening at its flat-domed head. The musalla has five divisions created with simple columns and a covered area for ritual wudhuw’ has been provided opposite the manara. A simple screen has been constructed at the facing, east, end of the complex, with pyramidical caps to short columns providing stability to the screen. There seem to be few photographs illustrating the early days of the central area of Doha, particularly suq Waqf as it is now commonly termed. This first photograph appears to be one of the earlier ones. 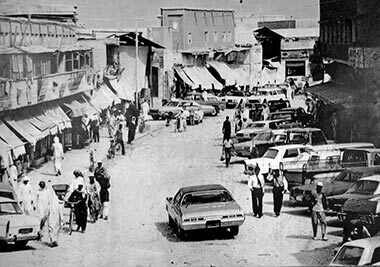 It was developed from an image of a photograph at the entrance to the suq and is said to have been taken in 1970, illustrating the north end of the suq and looking north. The original photograph was probably taken from the Bismillah Hotel. The second photograph was taken in February 1974 from a point further north than the first photograph. The main part of the suq was on the left with the shops in view mainly selling the tools increasingly in demand by the construction industry, though only for small scale works. Canvas awnings gave some protection from the eastern sun. Backing onto these shops in the covered part of the suq were shops selling lengths of cloth and clothes, both for men and women, and including tailors making up thiyaab both for Qataris and non-Qatari customers. The road is unmade but there is a raised concrete pavement on the left which offered a small degree of protection when the road flooded, the road having been laid along the path of the wadi which led into the sea immediately north of this view and subject to flooding from time to time. There is a brief note on the development of this part of the infrastructure on another page. The viewpoint of the second photograph is similar to the first but from its vantage point I was able to look both north and east. It looks down on the small parking area where the taxis congregated. In those days the taxis were virtually all Peugeot 404s, their drivers being members of the Taxi Association which also governed lorries and trucks. This was a vital part of the economy and supported other related industries. In those days people still carried out a lot of their shopping on a daily basis in the suq, and the majority of shoppers were men. Many of the shoppers required the taxis to take them and their loads home. Because of this it was relatively common to see taxis overloaded with many passengers or with unusual loads, large cases, tools, jat and goats being regular sights. The second of these three photographs was stitched together from two photographs and looks over what was termed the ‘second hand suq’. In the third photograph, the two-storey modern building was, I believe, ‘suq Faleh’ after its owner. Situated some way from the main part of the shopping area it did not receive the same foot-fall of the main suq and I recall it being virtually empty every time I visited it. The two-storey building top left on the edge of the third photograph was the Justice building. 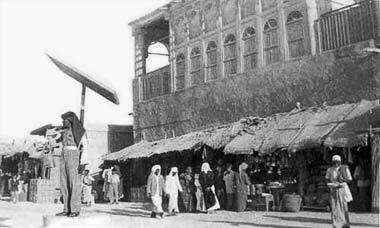 The old suq was an extension to the east of the main suq and was also referred to as the ‘Iranian suq’. Characterised by its labyrinthine layout and construction of temporary materials it was dramatically affected whenever the rains came as the covers were not waterproof and there was no drainage. All kinds of items were sold there, both imported material similar to the articles sold in the main suq, but also animals as well as second-hand items for which there was a market, most probably with the growing expatriate community. 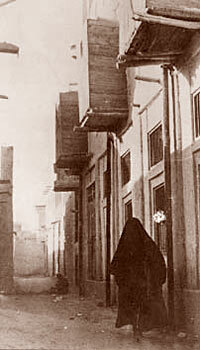 Even though traffic was not as heavy as it is now, the need to have a form of control was introduced in the middle of the last century and was demonstrated by a small number of traffic police located in the suq on small raised stands that gave them some form of protection as well as solar shading. This first photograph was taken of the north end of Musheirib street in either 1956 or 1957, depending upon which source you believe. Oddly enough, the sun shade appears to be slanting the wrong way and can’t have been that much help to the policeman standing there on duty. I can recall policemen on traffic duty in the early nineteen seventies but can’t remember when the system stopped. Recently this has been reintroduced, but I think it has to do with decisions on tourism relating to the centre of Doha and the reconstruction of the suq. In the background, the white building on the right is the Courts building. The second black and white photograph above shows the junction – leading west and left out of picture past the central maqbara – further south in the suq, with a merchant’s property of significant scale demonstrating the relationship of road to the retail element of the building. The heights of the building’s storeys was a feature of these old buildings and was designed to maximise the amount of cool air that could be contained within the internal spaces during the day and night cycle. There is a little more to describe this on one of the Gulf architecture pages. I don’t know, but believe the photograph is also likely to have been taken in the 1950s. The two photographs above suggest that traffic was a hazard in the days of its introduction and increasing use, though this would not be high by modern standards. The third, colour, photograph was taken in February 1972, and shows the same Police stand, this time unoccupied, and similar goods to the previous photograph still being sold in the shops behind. Note that, fifteen or twenty years later, there appears to be a similar casual attitude to walking on the road even though there is now a pavement constructed. The next two photographs were found on an Arabic site which has a number of old images on it taken within the Gulf and Iraq, but just states that the photographs were taken in Doha, with neither commentary nor date. It is possible only to hazard a guess at the date of the first, perhaps the 1950s, and it is unlikely to have been taken in the same year as the second. Certainly the first of them looks considerably older than the second and suggests an earlier time. 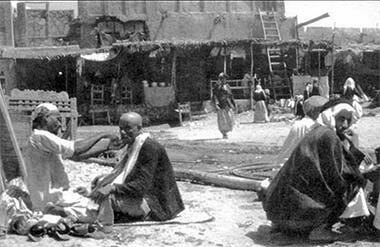 The first photograph captures a number of the elements of the suq of the early post-war days, perhaps even pre-war. The unmade pavement, a pair of pack-donkeys and the shuttered shops raised from the ground to avoid flooding were all part of the street scene in the centre of Doha. Of course, this might be an image of one of the minor roads leading to suq Waqf or Musheirib, but the density of people suggests otherwise. The second photograph looks south in the centre of the suq Waqf on what was the extension of wadi Musheirib. There are a number of cars moving around Doha by this time, with parking diagonally both sides of the main road. The area out of picture to the left of the photograph was where taxis and porters waited for customers, and the covered suq is on the right. The photograph may have been taken in 1955. Because of the problems caused by rains bringing floodwater into the centre of Doha, a dam was constructed in the 1960s outside the ‘C’ Ring Road containing and diverting rain waters from their movement through the suq on its way to the sea. However, heavy rains still occurred and, from time to time, the dam was unable to contain the floodwaters. Here is a photograph, taken in the 1980s and looking south, of the wadi Musheirib under water. The corner of the Bismillah hotel, said to be the first in Doha, can just be glimpsed on the left of the photograph. The covered suq is on the right and, being unpaved, would have been severely affected by the rains. A little further down the street and, by way of contrast, these two photographs are of the Bismillah hotel and restaurant, a new type of building to the country at that time. The photographs were taken from approximately north-east and south respectively, but the first I believe to date from the 1950s, the second from the 1980s. The building was situated at the bend of the wadi running through suq Waqf and, as such, occupied an important position both from an urban design as well as a commercial point of view. It appears to have been one of the first of the concrete buildings being established in the country. The trabeated construction is evident, and the detailing has much to do with that of the Indian sub-continent. Open ventilation can be seen and the shaded verandah will also have assisted in keeping the building cool, something which is important because concrete buildings can be extremely uncomfortable due to the retention of heat in the concrete. The introduction of electricity enabled restaurants such as this to install ceiling mounted fans which certainly helped cool the spaces within them. One of the major commercial companies in Qatar was that of Kassem and Abdulla, sons of Darwish Fakhroo. Their headquarters were situated at the north end of Doha’s suq, opposite and east of the police station and directly accessible to the sea and the jetty. This black and white photograph, taken in 1954, shows their first offices, the structure being a simple development of the beam and column construction of traditional architecture, complete with danjal connecting the columns to provide them with additional rigidity and functional maraazim positioned over the columns. The 1950s offices can be compared with the more imposing structure the Darwish organisation built later, this colour photograph of it being taken looking approximately south-east at its main entrance. The ground floor was mainly taken up with a showroom of large pieces of equipment with most of the offices on the floor above. It reflected the growing confidence of the commercial operations in Qatar, other companies developing offices on a similar scale. Suq Waqf street was the main road through Doha’s central shopping area. This photograph was taken in 1955 or 1956 and looks north-east along it, the road turning north at the end, towards the West Bay. The suq’s mosque can be seen centre left. Outside the mosque sat people mending shoes and selling household necessities such as traditional tooth brushes, along with scribes and their typewriters writing letters and legal documents. 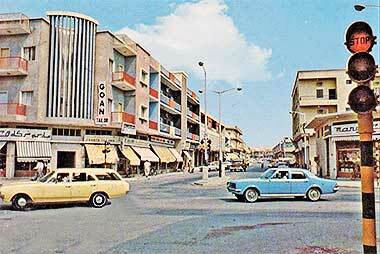 This is a view north of Suq Waqf street taken in March 1972. If you look carefully you can see that the building on the left of this photograph is the same building as the one that appears over the oncoming car in the black and white image above. There are two notable features here. The first is that the shops have their ground floor levels raised around half a metre about road level due to the possibility of flooding along the wadi sail, a continuing concern into the 1980s. The second feature to note is the large amount of maraazim on the older building. The north end of the Doha’s suq ended, effectively, with the Central Police Station on the west side and the Darwish company’s main offices on the east, both of them two storey buildings and visible in the first of these two photographs. By March 1972 when this photograph was taken the suq was a mixture of single and double storey structures, though only the ground floors being used for retail purposes. In the first photograph the open area on the right was used mainly by taxis, the main method by which customers with purchases in the suq were able to take their purchases home. It was common to see a number of unusual goods in the boots and back seats of the ubiquitous Peugeot 404s plying the streets. The second photograph is a detail of the first. The Central Police Station is on the left – all government buildings flew the national flag – the first road running across the end of the suq is now called Abdullah bin Jassim Street, and the Corniche is visible with the old port, or traditional craft jetty behind it. 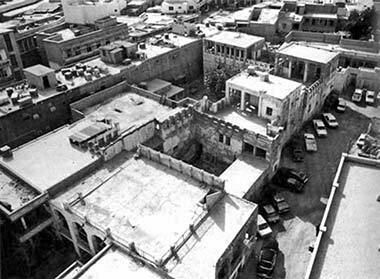 These three photographs, again from March 1972, show details of the west side of suq wakf and were taken from the burj of the central masjid. The first gives a good idea of the character of the buildings that formed this part of the suq with single storey structures on both sides of the pedestrian route that ran parallel, and west, of the road. The first photograph shows the beginnings of taller development as a mezzanine level had been constructed within the building on the left, for storage. The second photograph illustrates the two-storey development that was directly adjacent to and left of the buildings in the first photograph. It is difficult to know what was intended but the second floor contained both storage as well as, in some places, accommodation for expatriate staff operating the shops and providing an additional degree of protection to the goods in addition to those formally employed for that purpose. These next two photographs, taken on an afternoon in August 1972, show a little more of the character of the shops that fronted the main road through the suq. The shops each had double folding wooden shutters to secure them and, generally, they were not enclosed or air-conditioned, improvements that slowly moved in during the 1970s. Note the relative lack of signs as advertising was not yet thought to be necessary, although later it became customary to add a sign with the owner’s name and his commercial registry number, usually given as ‘General Merchant and Contractor’. The second photograph gives an indication of the numbers and type of people shopping in the late afternoon in summer. Most noticeable is the wide pavement. You can see that there is a large concrete addition on the outside of the pavement, this being the cover to the large drainage system that was taken along the wadi and through the suq to disgorge to the sea beside the traditional dhow harbour to the north of the suq. Turning and looking south, from more or less the same standpoint as that used in the photograph above, this was the view in February 1974 and shows the building that can be seen in the old photograph above. 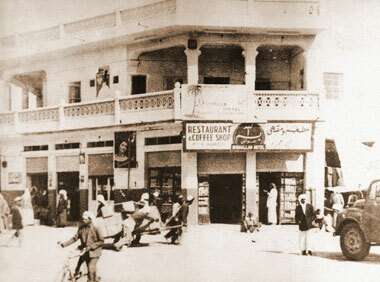 The corner of the Bismillah restaurant can be seen on the junction just in front of it. The cars in the photograph are being diverted to the left to avoid the excavation works being carried out to repair the drainage system at the junction. Round the corner, right, from this part of the suq was the central maqbara or graveyard. Opposite to it was that part of the suq that sold gold and jewellery and, further north, an area of workshops. These two photographs, both taken in April 1972, show the typical organisation of the shops and workshops in this part of the suq, with heavy double-fold doors secured by padlocks when the owner was absent. This particular part of the suq appeared to fabricate items to order as well as having a small supply of items relating to cooking outdoors for sale. This was also the area that sold large items such as suitcases and trunks, particularly metal. The lower photograph shows that the workshop appears to have specialised in kerosene lamps. The wall of the maqbara can be seen in the distance, the intervening land being used as a car park. This area, including the maqbara, is now all taken by car parking. The lowest of these three photographs shows the south-east corner of the maqbara viewed from the main road running through the suq. The covered suq starts on the right of the photograph, the Turkish fort hidden by the buildings on the left and, at the end of those buildings was the Arab Bank roundabout with the jewellery shop of al-Fardan. North of the area in the photo above, and to the west of suq Waqf was the chief area in which the merchant families established their presence along Doha’s old littoral. This helped them supervise the movement of goods directly from the boats standing out in the bay, the smaller craft shuttling between them and the shore. This enabled many of the merchants to build their residences in this area, these buildings also incorporating storage for their goods. The Darwish, al-Mana and other merchant families developed in this area of Doha and I believe that the two buildings shown here were located on the western edge of the central commercial area and belonged to two of these families, though I can’t recall which. The image, made in 1972 shows that the building was suffering structurally at that time. I don’t know when it would have been brought down. The first building, illustrated above, has an impressive scale, both in height as well as in the length of its walls, the building being essentially two storey with a room on the second floor roof and a badgheer improving ventilation to those using the room as well as the roof. By contrast, the lower building is smaller, being single storey but with two rooms added at first floor level – with the proportions of five to three bays on plan – and probably used in conjunction with each other. Many of these buildings started with their rooms being used by the owning families, but the upper stories being eventually given over to storage of goods. I don’t know the date of this photograph but would guess it to be contemporaneous with that above. Note that the buildings illustrate two different styles of local architecture demonstrated both in their massing as well as their vocabulary. The structures admirably demonstrate the character of the buildings needed to safeguard those who lived and operated from this central area of Doha. The walls are thick and tall, the openings at ground level are restricted and, in the first building, the structure at the upper levels is lightened by the use of columns and intermediate panels forming badgheer. The lightly decorated arcading suggests that development was carried out as a single construction, and the building was a significant size when compared with other buildings in the central area. The area in which these two buildings were located was to the west of suq Waqf and south of the merchants’ properties that lined the littoral of the bay. Here, in an imaged retrieved from a video is an aerial view looking approximately south-east illustrating a merchant family compound stretching back from the bay – out of picture bottom left – with the suq – out of picture top left. The photograph clearly shows the arrangement of courtyards with their surrounding buildings that served as both accommodation for the family as well as storage for goods landed onshore before being moved off to retail outlets. I believe this photograph shows the same property as that in the photograph immediately above, but at an earlier date. What that date might be I’m unsure, but it would have been taken at a time when small local craft brought the cargoes of the larger ships standing out in the roads onto the shore and directly into the yards owned by the major merchants. The small boat in the bottom left of the photograph suggests that the sea is immediately outside the photograph. Some time after the photograph was taken, a new road was constructed along the old littoral, leading west to the Diwan al-Amiri, Abdullah bin Jassim Street. This property had a two storey building constructed fronting this road and incorporating a retail outlet and a main entrance through to the courtyard established in front of the two storey structure of the photograph. While the suq contained a number of retail outlets within its built development, one of its more significant characteristics was the range of commercial operations that were carried out on the ground within the suq and that created movement and interest for those moving in and around it. These four photographs show something of this range of activities. These individuals carried out their trades or professions in the open, setting up in a spare corner and making their living from the sale of small items or through the application of certain skills. The introduction of bureaucratic processes within the State required paperwork to be created for a number of different operations. Some of this was to do with the preparation of documentation necessary for legal reasons, but there was also the necessity to translate documents for those holding paperwork in languages other than Arabic. In addition, there was the need for many to have work written or typed for them due to illiteracy or lack of an ability to write Arabic. Much of this work was carried out by translators and scribes sitting near the institutions requiring this paperwork, one of the locations being outside the main mosque in the middle of the suq. In the first photograph, taken September 1973, there are a group of scribes, sheltered from the sun by umbrellas, near the Shari’a Courts while they await clients bringing them work. The second photograph, taken in April 1972, shows one of the photographers working in conjunction with the scribes by taking portrait photographs necessary for some of the documents. Note the black backdrop cloth pinned up behind the sitter, and his informal position. The third photograph, above, from July 1975, was taken outside the main masjid in Doha’s suq wawf and shows a group making and mending sandals and shoes and associated leatherwork. Compare that photograph with the black and white photograph below it, taken in the 1950s, and illustrating how little had changed in the twenty year interval. This area also sold miswaak and similar small items necessary for the pursuance of daily life. On a wider selection of provision, the fourth photograph, taken in December 1983, shows a small but useful retail operation where a small group of women have set up a stall on cardboard selling a much wider range of small articles. Again, this was not a novel operation, although the photograph illustrates a more sophisticated operation than that in the black and white photograph below it. 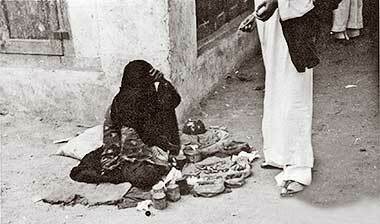 Taken in the 1950s, it illustrates something of the poverty of the country at that time, where small items were bought and sold on corners of the suq in order for this woman to make a living, the probability being that she was a widow with nobody able to support her, or for her to be able to make a contribution to the family with whom she lived. Gradually this sight disappeared with affluence and the government’s wish to benefit those inclined or forced to beg. But it was not just items of trade that were bought and sold, there were also people who used their skills to provide a variety of necessary services to those both living in town as well as some of those visiting from other conurbations as well as those living a more mobile life. Here, in a street in Doha’s suq Waqf, a barber shaves a customer in an operation that is very different from those which developed over the next twenty years. Compare this street scene with the more up-market version below, which was taken in 1972. As Doha and the satellite urban settlements in the peninsula developed, there was a need not only for people to sell items and skills within those settlements, but also for materials to be transported around them. 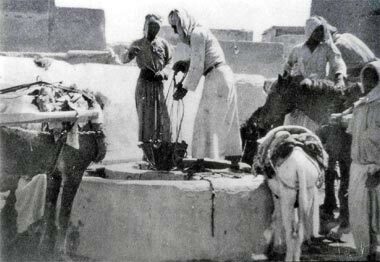 In this photograph, taken in the 1950s, a water seller using a traditional yoke across his shoulders, transports water in two tin cans around the suq prior to the installation of a piped water system. Bear in mind that, by the 1950s, the rising ground water under Doha was increasingly saline and not fit to drink. Goods and services were distributed through the suq and into the wider communities using a number of methods. For the heavier loads there were porters pulling two-wheeled barrows as shown in this first photograph where three porters are pushing a heavily loaded cart across a road in the suq. In a photograph below, a number of the carts stand waiting for use south of the vegetable market at the north end of the suq. Often the loads were taken by single porters carrying extremely heavy loads strapped to their backs as illustrated below with a porter carrying a very heavy set of crates. It was a common sight for porters to be seen standing, waiting for work, with their handling straps slung over their shoulders. For longer distances donkeys were the beasts of burden, often piled with high loads. In this photograph, taken in 1972, a donkey is being ridden through the suq by its handler either looking for business or moving to an appointment. Note the wooden framework strapped to its side onto which goods would be secured. Donkeys were also used to pull carts designed to carry water or gasoline among other items for sale. Although this photograph was not taken in the suq, but some distance south of Doha in March 1972, it shows a donkey pulling an improvised water tank to bring potable water to households in that area. The cart has been fitted with large vehicle wheels in order to allow the cart to travel over rough ground, such as this, in relative comfort. The driver sits far forward in order to maintain balance with the water. But some of the work of the suq porters was less strenuous. Here a porter has been hired to help a customer walk to his house, the customer carrying on his shoulder food for the goat, known as jet, and the porter leading the goat by one of its horns. Note the winter clothing worn by both customer and porter, the photograph having been taken in March 1972. Heavy goods were transported by porters and barrows but, with time, other types of vehicle were developed in order to protect and transport lighter and more precious goods. Here, on the ‘C’ road, a closed cabinet set on a tricycle fabricated from bicycle parts is being used to move goods around what was, at that time, 1975, the outskirts of Doha. It was a clever solution to the twin problems of protection and accessibility to residential markets. Note the refinement of mudguards over all wheels. The mobility created by wheeled devices produced a number of vehicles designed by their owners to carry the goods on offer safely, as well as enabling them to penetrate the residential areas where their chief markets lay – often areas that were not paved and difficult to access. This photograph, taken in 1973, shows a man selling to the children sweets and the like from a cart protected by net curtains intended to keep out most of the flies. Water was one of the main items to be transported, not just around the suq, but also around the residential areas which surrounded it. And there was also a perceived need for merchandise to be taken from door to door as women were not generally allowed to move outside their house unless accompanied by a male member of the family and, generally, men were responsible for buying household effects for which they would visit the suq on a daily basis, combining shopping with meeting friends, exchanging news and doing business. However, there was a need for women to buy items for their personal use as well as some of the necessities for household life. A number of travelling salesmen were a common feature of life, carrying their large bundles on their backs and unwrapping at each doorway in order to tempt the women – who would sit modestly behind the door – and bargain for whatever was needed. This was also a way in which the women of the household could keep up to date with news and fashions. As might be expected, the shops in the suq had to cover the whole range of materials needed by those living in the peninsula and Doha in particular. As was the pattern with Arab and Muslim towns, the area was organised in a manner that grouped similar uses together. Those uses that created nuisance by virtue of smell or noise tended to be located outside the suq or on its fringes. Hence the area for the sale of animals was at the far eastern fringe of the suq and welding and steel work generally was moved by the Municipality to the outskirts of Doha, with the exception of one or two of the smaller units shown above. There are some illustrations above which show something of the character of the suq in the early 1970s. In particular they illustrate the shops that lined the west side of the street towards its northern end. Behind them was an internal sikka or passage with a number of shops opening onto it on both sides. This was one of a number of joined sikkak that created an large area in which many different types of merchandise were sold. The sikka illustrated here was one in which cloths and materials were sold. Taken in 1954, the photograph shows how the sikka appeared when it was closed, the wooden shutters securing the merchants’ stock. The shops were built up above ground in order to deal with the rains that sometimes poured through the sikka as the barasti roofing, while providing a degree of protection from the sun and allowing some air movement, was unable to protect from the winter rains when the sikka could become a small stream. Here it appears to have a sanded floor, though I remember the floor in the early 1970s as being very uneven with, in the winter, large puddles despite it having been given a corrugated iron roof. This group of four photographs illustrate some of the units that formed the suq. 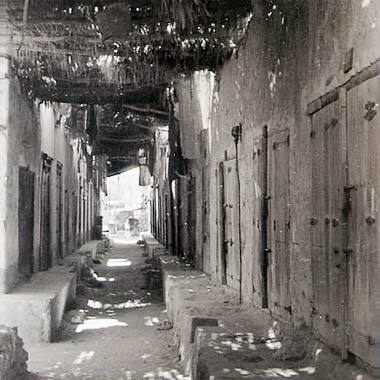 The first photograph was taken in April 1972 and shows one of the internal sikkak of the suq. Once open to the elements, this narrow route was recently roofed with a corrugated iron structure in order to provide a degree of protection to the activities carried out below. Despite this the winter rains created problems on the unpaved path. These shops sold a wide range of materials which could be bought and taken home to be made up by members of the family or seamstresses in the neighbourhood, or alternatively might be taken to the tailors who were in the adjacent part of the suq and who provided a customised service. The second is of one of the typical shops in the northern area of the suq that sold pulses and spices, both loose as well as, more expensively, imported in packages. The third photograph shows a shop that sold decorative illustrations for household walls, inexpensive jewellery, misbah, and decorative boxes. There were also shops that sold perfumes as well as shops selling tools and material for hunting and other requirements for the badu community. There was, of course, the gold suq that was well patronised by both locals as well as expatriates taking advantage of the high percentage of gold used in their products compared with other countries. The suq was also the place to be shaved and have your hair cut. This barber’s shop has three mirrors of different sizes, always a popular feature for those proud of how they looked, together with a large display of pinups from the Indian sub-continent and a range of pomades, creams and powders on the worktop. These units were very popular in the evenings and Thursdays, prior to the week’s public appearances on Friday when many of the expatriate community would promenade in their best clothes. Not all of the suq had this character of built environment. The majority of this development was confined to the west bank of what had been the wadi sail as that had been where the majority of development had been traditionally, the east bank being reserved for beaching and unloading boats. This can be seen in the photographs on the previous page, taken some time in the 1940s. 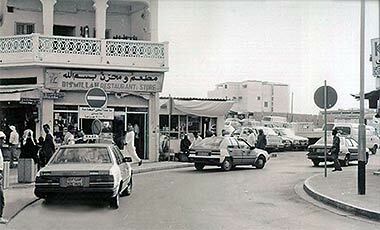 This first photograph was taken looking due east from the main suq in February 1974. The Shari’a Courts building can be seen at the top left edge of the photograph. Across the centre of the photograph can be seen a new two-storey commercial building, but I can’t recall who built it. My recollection of it is that there was little commercial activity being carried out in the 1970s. This area developed over a thirty year period and, with the exception of the above commercial building, the general character of the development was poor with a significant amount of barasti covering it, the name in this case being used to describe not just palm fronds which were relatively rare, but canvas and other material coverings that were used to provide shade to the merchants and their customers as well as limited protection from rain in winter – though, without drainage, the area was a quagmire in winter. Nevertheless it was a popular destination and usually full with potential customers. As you might anticipate from the hierarchy of markets, the character of the development differed across this area reflecting distance from the main suq. The part of this suq nearest to the road moving north through the suq sold similar materials to those in the shops to the west of the road – pots and pans, staple foods and the like together with some second-hand material – while, farther east, there were the larger materials such as charcoal and water storage jars as well as livestock in the form of chickens, goats and, on the other side of the Central Post Office, camels. The old suq was always an interesting place to visit with its wide variety of items for sale, the smell of spices and the friendly stall-holders. But at night it was even more inviting, particularly in those parts of the suq which had limited electric lighting or relied on kerosene lamps. In this photograph, taken in 1972, the stalls are lit with bare electric tungsten light bulbs, a common method of lighting both in the suq as well in residential buildings, particularly their courtyards. One of the more surprising characteristics of this area was the amount of the materials on sale. As can be seen in this photograph of the suq, taken in November 1972, there was a considerable number of aluminium pots and pans, trays and cutlery from the Indian sub-continent on sale as well as, though not in this picture, enamelled pans, mostly from China together with multi-coloured plastic containers. There seemed to be considerable activity in this part of the suq as well as in the main area to its west. While the various elements of the suq that have been shown in most of these photographs were in private ownership and established along the wadi leading to the sea, the government took it upon itself the provision of three buildings for separate market divisions; these were for vegetables, meat and fish and were developed on the new ground created to resolve the issues relating to flooding. The first structure built was that in the first of these three photographs, here shown looking north-east with the first floor of the Justice Courts building seen behind it. In the second photograph, taken in March 1972, the vegetable suq is seen from the south-east with the top floor of the Darwish main offices just visible top left of the photograph. Constructed of in-situ the vegetable suq was completely open at the sides and had ventilation provided in its roof. Note the barrows in the foreground used by porters to move purchases around. The back or south wall of the Darwish main offices can also be seen on the left in the third photograph which looks east towards the fish suq with the vegetable suq behind it and tomatoes being sold in the foreground. The two identical buildings constructed for the fish and meat aswaaq were rather different. Constructed as concrete frame and blockwork they had clerestory lighting and ventilation, but were both relatively dark inside. The building in which meat was sold was closer to the main suq than the fish market, the latter of which can be seen in the photograph above, while this first photograph, from April 1977, shows the arrangement inside with a waist-high concrete slab on which the sellers sat with their scales and the fish or, in the case of the other building, meat. At the entrances there were usually children who would shell prawns and carry customers’ purchases for them back to their car or taxi. The second photograph, taken in March 1972, shows a porter carrying a very heavy load of crates while a young boy carries an armful of large paper bags. Where the loads were much heavier, porters were engaged to load and manhandle the purchases through the traffic to the parked car or, in the probable case shown here in a photograph taken in 1968, to one of the smaller shops either in the suq or to the newer shops establishing themselves within Doha’s inner ring. 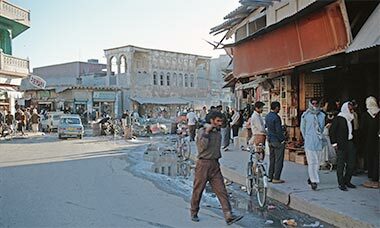 This photograph has been added here as it shows a similar scene in the centre of Doha’s suq Waqf ten years or so previously to that above. Said to have been taken in the 1950s the image illustrates the beginning of change in Doha. The revenues from oil were beginning to have an affect on building in the country but, in the centre of the suq change was happening slowly. The architecture here was developing from the traditional, but had no real character. The buildings are of traditional construction, but with rendered cement blockwork walls and timber joists and shuttered windows. There were also seasonal changes in the suq. The obvious ones had to do with the change in vegetables and fruit such as melons which would suddenly be found everywhere as every farm seemed to grow them, but the winter season was the hunting season. While the best hawks were moved around inside cars and trucks, there were usually hawks to be seen in the suq. Here, on a corner in November 1973, a group of men sit and talk with their hawks around them. With increasing wealth and development, commercial buildings stretched out of Suq Waqf south-west along wadi musheirib, their scale becoming increasingly larger to reflect the parcels of land acquired. From this street two commercial streets developed linking north with the Rayyan Road, Abdullah bin Thani street and Electricity Street. I am unable to say when this photograph looking south down Electricity Street was taken, but suspect it to be around 1970. Darwish had a large store, ‘Modern Home’, on the right – with the ‘Rolex’ sign on it – distinguished in being the first two-storey department store. Generally the other shops on the street were relatively small though large stores opened on the road that linked at the end of the street with Suq Waqf to the east, al-Musheirib street. The second of these two photographs is also said to be of Electricity Street, but I have the feeling that The Qatar National Travel offices, on the right, were not there, but on al-Musheirib street. Perhaps somebody would tell me if this is correct? The two storey mixed commercial and residential development was very typical in the early 1970s, and Qatar National Travel’s large neon sign illustrates the advantage being taken of the free electricity increasingly available within the peninsula. Parallel with Electricity Street, and east of it, was Abdullah bin Thani street which had a number of small shops on it selling a wide variety of items, the most important of the shops to Europeans being a ‘library’ or stationers – on the right where the small bus is parked – which sold European newspapers and some magazines. Again, I am unsure of the date of this photograph, but believe it must be from the early 1970s. 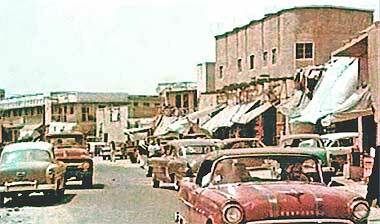 This photograph, also likely to have been taken in the early 1970s looks along al-Asmakh street. On the left is the manara of the local masjid, this one a simple, attractive design, very much in keeping with the traditional architecture of the peninsula. On the right can be seen a sign for the clinic of Dr. Kalantar, a well-known physician at that time. Note the condition of the pavement which has been dug up for the placing of services, and the steel reinforcement sticking up from the roof of the buildings on the left, awaiting another storey to be constructed. This next group of photographs were taken by using screenshots from an old video recording made in the latter part of the 1960s, probably 1968, and illustrate the appearance of some of the developments along the roads around the central area of Doha. Generally the names given here are those used by Westerners and relate to obvious landmarks. This first aerial photograph was taken looking east at the land side of Doha’s International Airport terminal. On the air side, embarking passengers walked to the aircraft from the north end of the terminal, disembarking passengers entering at the south end. The covered roof on the south side was much used for viewing, a very popular activity with expatriates, particularly in the evenings. This image was taken travelling north towards the centre of Doha along Airport Road and shows the Pepsi factory on the left and the unusually wide strip of land to the west of this particular road. This land was left free in anticipation of the development of a wider carriageway with off-road parking and landscaping in and adjacent to it. In the other direction, the road led to Wakra and Umm Said. The next photograph shows the south entrance into the Cable and Wireless roundabout with their three-storey offices hidden behind the large accacia tree on the right, and the Mercedes showroom on the left. The buildings on the other side of the roundabout were established by the Ministry of Electricity and Water in the early years for the production and distribution of electricity, the site being considered at that time as being on the outer edge of Doha. This building illustrates a common notion for development of the time, that of providing the possibility of adding another storey to the building should it become necessary, or profitable. The building housed at ground level a large shop which sold Arab books and textbooks. Residential apartments comprised the rest of the building in a similar way to much of Doha’s development. The road to its left led off towards the Salwa Road and, eventually, Saudi Arabia. This view of a part of Musheirib Street shows its character derived from the farm which once thrived there. This road was a part of the wadi sail which led through the centre of Doha’s suq, past the Darwish family’s offices and into the sea at the country craft jetty. While there was planting in this triangular piece of urban landscape, it was popular with the expatriate labour force as a place to sit and meet in the evenings. Taken from a car, looking north of east towards the Arab Bank roundabout, this photograph shows the Doha Palace Hotel on the right with a run of shops with associated offices selling, in the main, heavy duty building equipment. On the other side of the street were a series of smaller retail units offering a range of similar materials together with puncture repair shops and the like. Turning left at the lights, and north, would lead into Abdullah bin Thani Street, as it was known, and where there was a shop, or library as this type of shop was termed, selling newspapers to the expatriate community. Here is the view north, up Abdullah bin Thani street, probably taken around the same time as that above. The previous photograph looks approximately east towards Doha’s central suq. The traffic light on the right is the same as that on the right on the photograph above. The character of the architecture was changing with more commercial units being provided within the inner ring of Doha. These units are typical, having a ground floor with mezzanine over which there were two floors of, in this case, residential units. These upper floors were also used for commercial units as the need arose. This photograph shows a part of the east side of what was known as the Akai roundabout. On the right, a road led towards the large, open air eid masjid and the kuwt fort south-west of Doha’ central suq, now known as suq waqf. The buildings in the photograph belonged to the al-Uthman family, the roundabout taking its name from the Akai and other Japanese equipment sold in the shop on the left. The buildings on the higher ground behind the shop were part of the Fire Department’s central operations. At the roundabout at the top of Abdullah bin Thani street there was the possibility to continue north past Ali bin Ali’s Cold Store – in competition with the Darwish Cold Store in front of the Diwan al Amiri – and then Sheikh Suheim bin Hamad al Thani’s residence to the road’s junction with the Rayyan Road. Turning west at the roundabout you were led past a masjid on the right and a sub-station on the left into Breadshop Street where there were a number of shops selling bread – hence its nickname – together with stores catering for dress and furnishing materials and with a dangerously maintained pavement. The lower photograph gives an indication of its character. The road led to Electricity Street where Darwish had their up-market Modern Home store. The Rayyan Road led almost due west from the Grand Mosque and Diwan al Amiri to the conurbation of Rayyan where many members of the al-Thani family had made their homes. 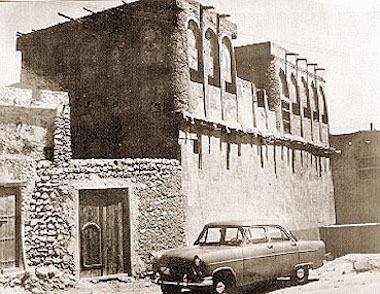 At its east end, near the Diwan al Amiri, there were a number of houses belonging to members of the al-Thani family, but after the link down through al-Bida to the Corniche, the road took on a commercial character. This was the first road in Qatar to be given electric street lighting. The developments were both single and three-storey, the latter coming later with apartments on the upper floors. On the ground floor there was the normal arrangement of showrooms with mezzanine offices. The single storey building in the centre was Salaam Studios, one of the main commercial centres for expatriates, dealing with photography. In the 1970s Salaam was the first commercial development in the New District of Doha. Note in the photograph that there were still residential buildings on this road in 1968. At the junction of the Rayyan Road with what became known as the ‘B’ Road, was the Toyland roundabout, named after al-Nasr’s Toyland store on its north-east corner with its parking in front of it. This view of the store is from approximately the north-west along the road leading to the British Embassy, Guest Palace and the Fort. The buildings in shadow were the al-Mannai offices and showrooms. Just west of the Toyland roundabout, the character of the road changed as is illustrated in this photograph. Its main feature was that it was considerably wider. On the left was a masjid, out of picture, a petrol station and beyond the four storey residential building on the south side of the road, a run of villas where a number of foreign missions had their embassies. With more space available for development it was possible for the government to construct larger projects such as a general hospital along with the Women’s hospital. 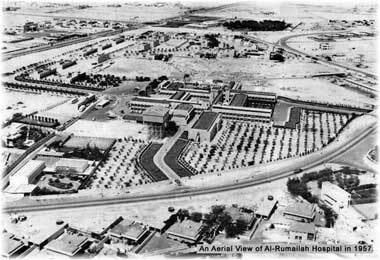 The entrance to the main hospital in Qatar, Rumaillah Hospital, was on the north side of the Rayyan Road. This photograph shows its entrance with its water tanks in the background. There are more photographs of it below. Note in many of the above photographs the characteristic column and beam construction using reinforced concrete with concrete blocks for infill panels. For comparison here are two photographs of old houses in the centre of Doha which will have been constructed using the traditional system of building. These existed at the same time as the new developments illustrated above, came into being. The rendered ground floor walls appear to be solid for the sake of privacy and security and, in the ground level walls where the render has come away, they can be seen to be solid masonry constructed of desert hasa or, perhaps, hasa bahri. But I think it’s more likely that the two storey houses have been built with the same column and beam construction, the outside wall finished flush without reflecting this. Note in the top photograph a small ventilation hole at the top of the ground floor to exhaust hot air. I should also mention that the use of solid ground floor walls contrasts with architecture in Bahrain and Dubai where there were often majaalis fronting onto the public sikkak that passed them by. Inside, the structure would have been expressed, creating alcoves which are used both decoratively as well as functionally for storage, shelves or hanging items. Note the rounded corners of the first floor which show that the result of using random-shaped stones for masonry means that you can’t have a bonded, right-angled construction as you would have with rectangular blocks. You can see the badgheer system operating at first floor level both in providing air to the enclosed rooms while safeguarding privacy, and allowing air to sweep onto the roof surface in the open roof areas. Rainwater is shed from the roof with mirzam. Note how many are used in an effort to shed the water quickly and prevent its build-up and the associated risk of penetration. In the lower photograph the poles providing the structural foundation of the first floor have been allowed to project to their different lengths. Only in the houses of the better off would the poles be cut to a common length. By projecting the poles through the walls they provide a more secure structural support. It is notable that there is no naqsh work to be seen as would be anticipated in good quality buildings. These appear to be the houses of ordinary merchants living in a relatively tight urban situation despite the fact that there appear to be relatively wide roads in front of both buildings, suggesting they would have been constructed in the 1950s. I was under the impression that this photograph was taken in Rayyan, but now think it to be Doha. It would have been a relatively central area as the buildings appear to be two, even three storeys high. The photograph would date from about the nineteen-fifties. It’s not possible to tell if they are plumbed into a drainage system. I would have thought that, at the time, the stacks would lead to septic tanks, but the fact that they are in a line and look as if they were constructed as a single development suggests that they might, in fact, be part of a proper sewerage system. Interestingly, I don’t recall seeing such systems above ground floor level, nor do I know when a sewerage system was introduced to Doha though there was work being carried out in the nineteen-seventies. This photograph was discovered in the suq, but regrettably there was no way of identifying where it was taken. It is interesting in that it shows a relatively poor neighbourhood. There are at least four points to note in the photograph. Firstly, the width of the road is considerably wider than was traditional and certainly wider than the centre of the suq. To me this implies a later stage of development or, perhaps, a more littoral development. Secondly, the two retail units are built higher than the road by a considerable amount, suggesting that the area was liable to inundation, or at least that there was concern for flooding. Thirdly, the wall on the left has less juss to complete its surface from that on the right, which is a less expensive finish and, therefore illustrates a poorer neighbourhood. Fourthly, the building on the left has maraazim to lead water off its flat roof whereas the building behind it and on the left has material draped over its sloping roof, perhaps as a temporary solution to a roofing problem. It is typical in a sense of barasti development, and it is interesting to see that there is the traditional material used on the right to create shade, the supporting mangrove poles spanning the whole of the street. On the previous page there are four photographs of the fortified structure in the village of Umm Salal Muhammad. The building is both a watch tower as well as protection for a considerable area of cultivation and its associated water source, a small dammed wadi adjacent to it. This photograph, looking east either from the tower or, perhaps, from the burj of the adjacent masjid shows, beyond the simple houses, the water source. On the horizon to the right, there is one of the Barzan towers. 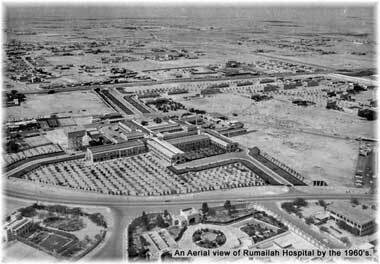 The mid nineteen-fifties saw the development of a hospital at Rumaillah, north of the Rayyan Road. 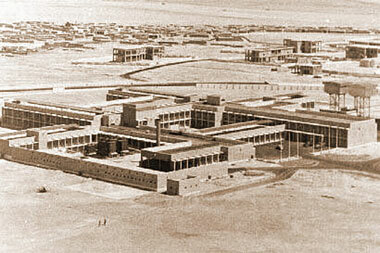 This first photograph, taken looking north-east, is of the hospital, built on the slightly higher ground and western edge of Doha in the fifties. It is obviously a concrete frame construction and owes its origins to the development of British architecture in the Indian sub-continent with its reliance on shading and cross-ventilation to create rooms which were relatively cool. It differed from the traditional construction of the country and, of course, it uses different materials and was designed to encompass a new scale and number of spaces compared with traditional architecture. On the other side of the road can be seen the beginnings of residential development for the expatriates who were being brought into the country to work for the government in the oil industry, and the medical and the construction industries, particularly the engineering and utility services. Some of the housing was in two-storey traditional buildings relying on natural ventilation – soon supplemented by air-conditioning units – and seen in the first photograph, and some was in single storey bungalows seen at the bottom of the second photograph. 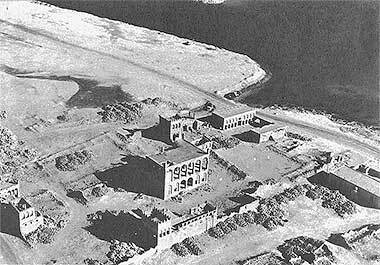 This second aerial photograph shows the hospital complex, this time looking down from the north-east. The curved road at the bottom of the photograph is the road leading to the fort, and the angled road at the top left of the photograph is the Rayyan Road, running east-west. Above the road, and in the bottom left hand corner of the photograph, is the British Embassy and Residence, now gone with the Diplomatic mission removed to the New District of Doha. The third of these photographs is taken from a similar angle as that above it but shows that the government housing at the bottom of the photograph that was constructed for expatriates, has been taken down and the Guest Palace placed there. The entrance to the Guest Palace is the white structure in the lower centre of the photograph. The photographs above show something of the character of the new developments on the outskirts of Doha, those being in the area of the hospital west of the centre of Doha. But Doha also was expanding to the east and, particularly to the south. This photograph, looking approximately south-west and likely to have been taken in the 1960s, gives an indication of the character of this suburban development, the photograph showing a number of sites apparently of a commercial or industrial nature mixed with residential developments. The sites are larger than those of the centre of Doha though the cost of land was escalating in response to the increasing wealth of the country. 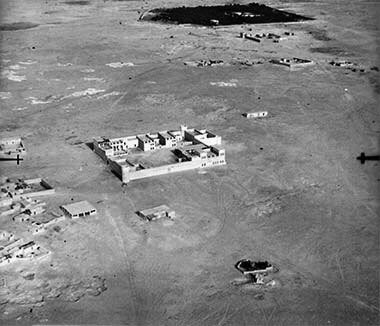 This photograph was also taken in the 1960s and is almost the reverse of that above which illustrates how close the unbuilt upon desert was to the hospital and Guest Palace. In this photograph, looking over the housing of al-Bida and Rumeillah, the extent and density of the housing can be seen as well as the proximity of the sea. What can’t be seen from either of these photographs is that this part of Doha sits on a slight rise above the housing behind, the ground rising significantly along the side walls of the Guest Palace. On the right of the photograph is one of the two-storey housing units built for expatriate government employees. 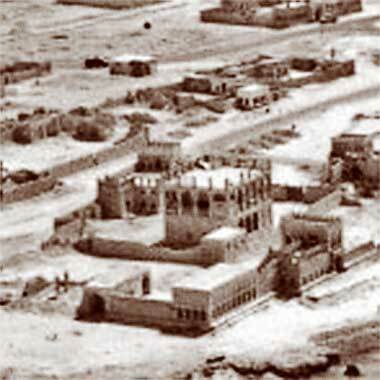 While the centre of Doha was developed and important structures such as the hospital built, housing was also changing. The first o these two photographs was taken in the 1960s and looks out across part of feriq al-Salata. The housing is courtyard in style with many of the structures having some form of decoration at the intersection of beams and columns. Some roofs are obviously designed to be used but, in the main, they are not and are just finished in the traditional manner. It is noticeable that there are no wind towers. This second photograph illustrates the later housing development in feriq al-Salata that was common at its fringes where there was more land available for development and where the government instituted wider roads. Here the housing can be seen to enjoy tall ceiling heights, car ownership was more common, there were telephone lines appearing ̵ though as yet no street lighting, and children played on the streets. What is evident is the change in character between the densities of the urban environments illustrated in the two photographs. Traditionally development in the peninsula occurred both on the coast as well as within the interior, the latter being associated with the movement of tribes in and out of the peninsula and with farming of areas of rawdha. Some of the developments were loose groupings of buildings usually with enclosing walls established in areas where the tribe claimed land. In this aerial photograph, taken in 1968, the people living here had enough power to attract a new masjid to be built for them. Note that the buildings open to the south, turning their backs on the shamal winds. While development within the Qatar peninsula was mainly focussed on Doha, other centres around the country also saw some development. 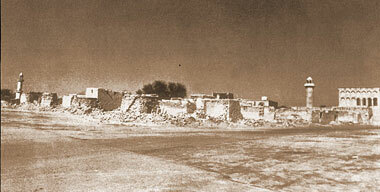 The old centres of al-Khor, al-Ruwais and, later, al-Wakra, saw new development, mostly constructed away from the old housing that had been built along the coast which was left, in the first instance, to decay. But other small centres also saw development associated with those who had traditional rights to settle in those areas, as well as responding to government initiatives to collect and settle the mobile population. The small settlement at al-Sumaismah was a case in point. These three aerial photographs illustrate the beginnings of the new style of residential development, and were taken in the 1980s. The settlement of al-Sumaismah is situated roughly two-thirds of the way between Doha and al-Khor. In the early days of settlement there was a coastal track linking the two towns, and this would have passed through al-Sumaismah. But development of the North Road five to fifteen kilometres from the coast, reduced its viability to some extent. Located on an open stretch of coast the settlement is now approached by a five kilometre link road east from the North Road. Set back from the coast, the government established a road pattern within which land was distributed to those wishing to live there. Note the single masjid established for the growing community and, in the first photograph, a large residential development established on the coastline. These next three photographs are illustrative of the beginnings of modern constructions in the peninsula. The architecture is of column and beam construction, the beam spans are relatively short, and the scale of the buildings is larger than those preceding them. As mentioned elsewhere, by the 1950s, the country was becoming more stable, the population was increasing with the return of many who had left in the impoverished times prior to and immediately after the Second World War, and expertise was being sought abroad in order to help with the country’s development. The burgeoning oil industry, particularly, required labour and, with it came the need for government facilities. In these two photographs, taken in 1954, the Darwish Contracting Company were one of the first companies to be able to take advantage of the boom which was beginning. The construction is interesting in that the columns are built in the same manner as traditional buildings, though with concrete blocks rather than hasa. Although the façade appears to have concrete beams, the beams supporting the floors look as if they will be timber, contrasting with structures such as the government schools which had concrete floors. The building is possibly the old Government Guest House where expatriates were first housed when they came to Qatar to work for the State, or one of the other houses near the Guest Palace which became the Polyclinic. All are, sadly, now demolished. The first photograph shows Abdulrahman Darwish Fakhro holding one of his sons at what looks like the intended entrance to the building. The lower photograph shows Abdullah Darwish, one of the sons of Kassem bin Darwish Fakhro, on site. The Darwish family was one of, if not the most important merchant family in Qatar at that time. This photograph, taken in 1954, is of the house of Abdullah Darwish showing the scale of the house and its compound, with development still being undertaken. The style of the architecture is very much traditional in character and detail. The corner column is buttressed, which is unusual, but there are the common decorative features at the junction of columns and beams, and a large number of maraazim which are certainly decorative and are also likely to be functional. The building appears to have two parts to it, the far part incorporating screens in its openings. While containing no badgheer, the third photograph, a residence, is still very much a Qatari building. It is interesting to see the cows wandering round the site, a reminder that many Qatari families relied on a variety of animals such as camels, cows, goats, sheep, hens and rabbits within their sites, providing them with some of their daily needs. These next two photographs are interesting as they show something rarely seen – part of the operation of the centre of a household. A similar bi’r would have been a central part of every household’s operation. Unfortunately, the proximity to the sea, the rising salinity levels caused by both this and water abstraction as well as problems created by nearby septic tanks created increasing problems for this source of the household’s water. This led to the market in water transported around the town in tankers – both donkey and lorry based – and eventually to the piping of potable water along galvanised steel pipes into similar tanks resulting in the common sight and taste of rust. Above the two doors to the left of the photo are permanent ventilation openings and the two windows are protected by iron bars as well as – in the case of that on the right – what appear to be internal shutters. The final item to note are the pigeon boxes on the back wall. It was common to have these as well as seeing hens within the compound. The last photograph shows two women grinding wheat in a large pestle as they prepare harees, a traditional meal that requires the soaking of crushed wheat and then mixing it with a meat, cooking it and serving it with a sugared topping. Just as with machboos, every family has its own jealously guarded recipe adding different grains, vegetables and spices in differing proportions. There are household items ranged along the wall and the children of the household are watching. Why they’re not helping or playing, I’m not sure. 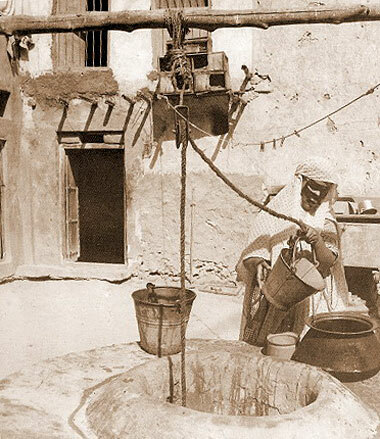 The sepia photograph, two above, illustrates the operation of a bi’r within a courtyard in Doha where a bakra has been permanently suspended above the well in order to help draw the water up. In rural areas this was not always possible or practicable and water was drawn either manually as appears to be the case here, or with the use of animals, usually either camels or donkeys. 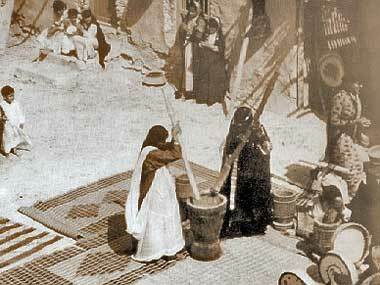 In this photograph, probably taken in the 1940s or early 1950s, water is being drawn in a canvas bucket by a badu from what seems to be a free-standing bi’r with houses seen behind it. The animal on the left has shafts attached to it suggesting that it might be pulling a cart to move water. The bi’r has a channel at the top left which would be filled with water in order to permit animals to drink. In its height and drinking arrangement it is dissimilar from the alabaar found in rural locations. This photograph is apparently one of the oldest here, having been taken in the 1930s. It shows a group of people, young and old, men and women, hauling at a rope in order to draw water from a well. There is not sufficient detail in the photograph to know where it is or to glean any other details. I would guess that it is in the desert and that the well may be deep, but why it takes so many people to haul the rope I have no idea. Looking at photographs such as those on this page, it can be difficult to understand how people lived in the Qatar peninsula only two or three generations ago. This photograph was taken in the nineteen-forties and shows women washing clothes in the sea. I can not say where this was taken but it is likely to be at either al-Khor, al-Wakra or, perhaps more probably, Doha at al-Salata. You can see the relationship between houses and the water which was typical of many of the littoral villages that were dependent for their economies on fishing and, perhaps, pearling. The beach was the centre of activities not just related to the boats and their maintenance and operation, but also to household functions. The sea was a great resource, but there was little else to support those who lived beside it. Contrasting with the housing types shown above were the barasti developments that sprang up, mainly on the outskirts of the major towns, and particularly around Doha where the scale and rate of infrastructure development was beginning to escalate. Small groups of temporary barasti housing were developed near areas of active construction, often no more than a single structure or two for workers and, sometimes, security guards. But with significant numbers of workers to house, the Doha Municipality set aside a large parcel of land south of Doha and just inside the ‘C’ ring road where housing for government workers was directed to be organised prior to more formal housing being constructed – even further south of Doha and, compared with the light barasti construction, in concrete units that were very uncomfortable in summer. This aerial photograph, taken in 1973, shows a part of the area with, at the top right of the photograph, its relationship with commercial or State housing evident. As you can see from the photograph, barasti had no formal layouts planned for them and developed in response to the needs of the groups of workers sent to live there. In this way workers from different parts of the world – for the most part, the Indian sub-continent – were able to construct groups of building responding to their particular needs. Bearing in mind that many of the residents worked for the government, the barasti were generally well supplied with water and electricity as well as temporary building material, though the area lacked proper sanitation and drainage. There is more written about the barasti on one of the Gulf architecture pages, where there are a number of photographs taken in the early 1970s. This photograph was taken on the 9th May 1935, one of a number of images made from a Royal Air Force flight over Qatar. The image looks west and is said to illustrate an emergency landing site identified for use by aircraft flying on the air route to India. This is likely to have been for the benefit of the leg between Bahrein and Sharjah. Although the image is clear, it is difficult to discern the exact area on which an aircraft might land unless it is the wadi along which a path can be clearly seen. But this would have been difficult due to the scrub that would be growing in the fertile rawdha of the wadi, some of which might be large enough to create problems for a landing aircraft. There are also small structures in the centre of the photograph. Consequently I assume landing would be the area to the right to it. It would be interesting to learn whereabouts in the peninsula this was taken. From the scattering of rawdha, I would guess towards the north. But, prior to this, there had been an interest in the possibility of oil being found in the peninsula as early as the 1920s, following investigations elsewhere in the region. A request to explore was begun in 1922 with a lease granted in 1926 to A.P.O.C, an early predecessor of British Petroleum. This was given with the understanding that a geological exploration of the peninsula would be made in return for the sole right to submit an application for a concession. The first licence was granted in 1932 and, in 1933 explorations found similar geological formations to those of the oil fields discovered previously in Bahrein. In 1935 a seventy-five year oil concession was signed by A.P.O.C., there being the suggestion that the British offered a degree of protection against Ibn Saoud of Saudi Arabia. 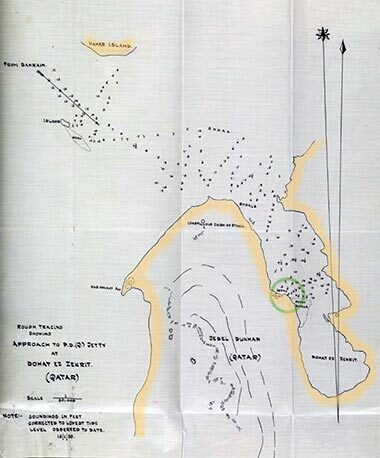 The illustration to the side has been adapted from a rough tracing showing the marine approaches to the bay at Zekrit and the jetty located there. Access in those early days was from the sea. The camp was located immediately to its west. Oil was found onshore at Jebel Dukhan in 1939 with another strike ten miles south in 1941. However, December 1942 saw the Dukhan camp closed due to the war and not re-opening until the Spring of 1947. Oil exports began in December 1949. There is a related note to airport development on the previous page. A number of notes have been made on the Hawar islands in these pages, particularly in the history section as the islands have been an important strand in the territorial history of the Qatar peninsula. Researching something of the history of Qatar in the early part of the twentieth century I came across three images which I have placed here rather than on the history page, though I have cross-linked the note both for those with an interest in this particular facet of Qatar’s past as well as those with an interest in the fortified structures of the region. The photographs appear on this page solely because they are old photographs. For many years there has been a dispute over the ownership of the islands, Qatar claiming them as they are immediately adjacent to the peninsula, and Bahrein claiming them on the basis of their having occupied them for a long time – the arguments are more complex than stated here and can be followed in the International court case that decided the legal boundary between the two States. The first photograph shows the pier that was constructed to allow boats to land individuals and supplies to the main island. It was four hundred feet long in order to reach deep water. On the pier can be seen a line of nine soldiers standing at ease with a small group in front of them. What appear to be a small number of packages stand on the pier, presumably brought over by the boats on the left. The fort can be seen in the distance, right, with its entrance showing, and there appears to be a barasti structure in front of it. The second photograph shows the fort constructed on the main island of the Hawar group. It is referred to as a stone constructed ‘Police post’. The design is different in form from those on the Qatar peninsula, being smaller as it would have held only a small garrison. It is a single storey building with a second floor tower at one corner and, significantly, has no rounded construction as do many of the other fortified structures in the area. The men in the picture look as if they are working on the building as they are carrying baskets, suggesting a building operation. The individual on the right appears to be holding a rifle. This photograph was taken of the other side of the structure, compared with the photograph above, and the barasti structure is visible on the right. I have added a detail of the fort to illustrate the crenellation detail which is different from those found in Qatar. 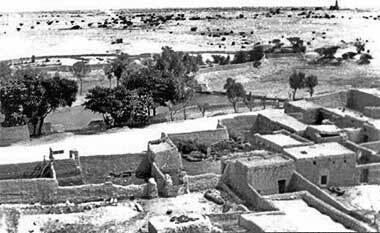 This third photograph was on the same page as the two above where it is named ‘Bilad as-Shamalia (North village)’. I am uncertain as to where this is, but the fact that it was on the same page as the other two photographs suggests that it is of the village of ‘Deira as-Shamaal’, the northern of the two villages on the main Hawar island. The associated notes state that the fort is adjacent to the village, and it may be that this photograph was taken from it. Use of the word ‘deira’ suggests that the writer saw it as a less than permanent settlement. Note that the structures have pitched roofs rather than flat roofs which would have suggested more permanency. These two photographs also appear on the page looking at the activities relating to boats, and were found on sale in the suq. They illustrate something of the activity on pearling craft, though there is far more to understand than what is illustrated here. I am unable to put a date to the photographs but believe that they represent actual conditions of pearling and are not re-creations of traditional life. And this was a hard life, experienced under harsh conditions, but was one which appears to be regarded wistfully by those who were involved in it. While visitors to the Gulf are now able to see the fishing fleets in action and perhaps take advantage of the recreational craft operating as businesses, most will also be aware of something of the history of the pearling fleets on which the original wealth of Qatar was largely founded. Although the industry was crippled by the development of cultured pearls in the Far East, there are not only merchants and divers alive who participated in pearling in the Gulf, but even some who occasionally dive, recreationally, for pearls. 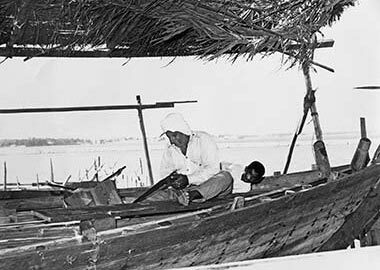 This photograph is an enlargement of a portion of the 1904 photograph above showing a number of traditional craft, notably the bateel and baqaara among them with wooden poles used to prop the craft in upright positions on the foreshore. It is not possible to see the stern of the nearest craft but it appears to have, as would be expected, no cutaway in front of its rudder to accommodate a propellor, this being a development brought about by the advent of diesel engines. The next three images, associated with boat building, were made from some old black and white photographic prints. They were found with a small number of others when I was going through some old files that had not been looked at for a number of years. I didn’t take them and don’t recall where they came from, but one of them has a typed reference to Qatar on the back of it so I have made the assumption that they were all taken in Qatar. 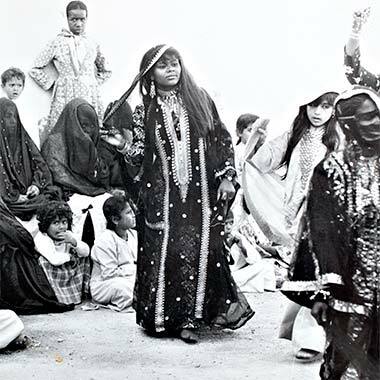 The images are included here as I believe the photographs were taken in the 1970s, perhaps with the purpose of describing traditional life in Qatar. In the 1970s and 1980s, the government of Qatar, through the Ministry of Information, was producing transparencies, postcards and posters depicting both modern and traditional subjects. These images were made in colour, but some black and white images were also produced as postcards. These photographs are a little larger than A5. Inspection of the backgrounds of the first and third images shows they were taken in or around the same location, but I can’t locate it from memory unless the construction was taking place at al-Khor. If the photographs were not taken in Qatar, then they are likely to have been taken nearby, perhaps Bahrein or the Emirates. It appears that all three of the photographs were taken with the aid flash to illuminate the subject, which suggests that a professional photographer was used to make the images, perhaps with the intent of producing material that would be used by the government for publicity, as mentioned above. The first photograph shows a shipwright making a two-handed saw cut along the edge of a short timber plank, while behind him a recumbent boy looks at the camera. The plank is propped up on a timber block to keep the saw clear of the deck, and he is using the weight of his foot to hold the plank down and steady. 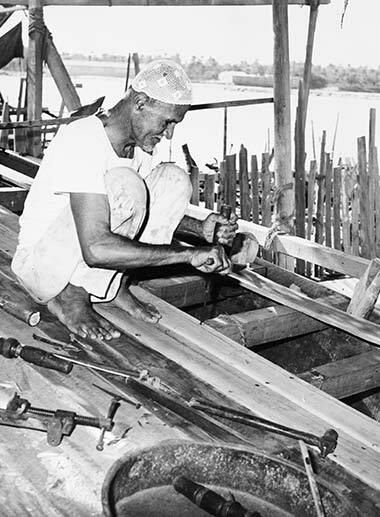 In the second photograph a shipwright is using a najaz to trim away the back of a piece of timber, steadying the piece with his right hand and, perhaps, foot to prevent the timber rotating away from the force of the najaz strike. The last of these three photographs shows a shipwright working with a bow drill. Other bow drills can be seen near him, along with a hammer and, bottom left, part of a small clamp. He is drilling holes that will fix the decking planks through to the cross beams. It is a tribute to the character of these tools that they have lasted so long in boat construction, only recently are power tools being used to speed construction. 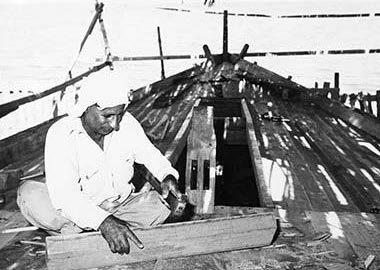 More has been written about boat building on the pages looking at this element of the heritage of the Gulf. This photograph also comes from the suq and shows, I believe, children playing marbles. Having said that, the main participant appears on close inspection to be a man, as is the person standing on the left. Nor am I certain that this is a game of marbles as there isn’t enough detail to tell. But the action is typical of the game, so I have made that assumption. It is not possible to tell the date of the photograph, but it is likely to be no more recent than the nineteen fifties. Perhaps ‘Play’ is not the correct grouping under which this particular photograph should be located, but the girl or young woman dancing appears to be with other women at an event, perhaps a wedding or similar celebration. There are no men in the photograph, only women and girls. The photograph is from the same group of photographs as those associated with boat-building, shown above and, I would guess, was taken around the 1970s probably with the intention of using it as an informational poster or postcard. The young woman is wearing traditional Qatari dress complete with necklace, bangles and rings and, on her left wrist, there is a small wrist watch. Both she and the young woman on the right are dancing barefooted on ground that is not clear of small stones. The woman dancing on the right edge of the photograph wears a batula, but the women watching all wear veils over their faces. There are a small number of old photographs to be found of individuals of note or of those engaged in activities which might not be covered here. Nevertheless they are old photographs which might be usefully added in order to give more depth to those relating to the old architecture and activities of Qatar. The first two photographs are images I made, presumably from original images, in the 1980s. This first photograph is of Sheikh Abdullah bin Jassim al Thani, son of the man commonly considered to be the founder of the modern State of Qatar, Sheikh Jassim bin Muhammad al Thani. 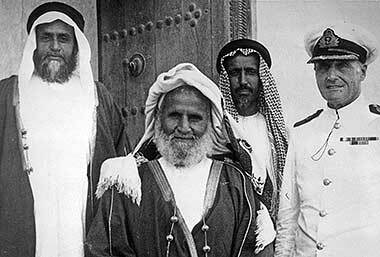 On his right is his son, Sheikh Ali bin Abdullah al Thani, who became Ruler following his father’s abdication in 1948 and, on Sheikh Ali’s right is his brother, Sheikh Hamad bin Abdullah, grandfather of the present Ruler, Sheikh Hamad bin Khalifa al Thani. I would guess that this group is standing outside an entrance to the development on the site of what is now the Diwan al-Amiri, and that the two Europeans might be British, perhaps the Resident and his wife. If anybody knows, please would they let me know? Sheikh Abdullah died in 1957 at the age of 77, so this photograph would pre-date that. The second photograph is located here with no names associated with it as I really am not clear who they are. The man on the left is Sheikh Hamad bin Abdullah al Thani. The man on the right is wearing British Royal Naval dress, but I can’t see enough of his epaulettes to give his rank. 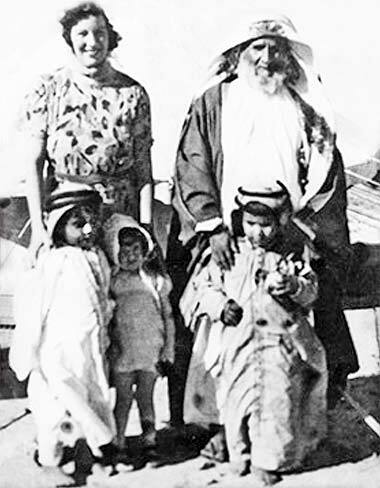 This photograph was developed from an image on the website of the Diwan al-Amir, and is said to show Sheikh Abdullah bin Jassim al Thani standing in front of a tent with two of his grandchildren, from the right, Sheikh Jassim and his younger brother Sheikh Khalifa bin Hamad bin Abdullah al Thani. On the left of the photograph is said to be the visiting wife of the British Resident based in Kuwait, Mrs Dickson, spelled Dixon and, apparently, her daughter. But Sheikh Khalifa bin Hamad was born in Rayyan in 1932 and appears to be around five years old in the photograph. If this is so it would date the photograph to 1937 when Sheikh Abdullah would have been 57. On one Arabic site, now taken down, the date of the photograph was given as 1939. However, Sheikh Jassim bin Hamad bin Abdullah al Thani is said to have been born in 1921, eleven years before Sheikh Khalifa bin Hamad in 1932. It appears from inspection that neither of these two boys are the right age if 1937 or 1939 would be the correct date of the photograph. Nor, obviously, is there eleven years in age between them. The location of the photograph has been given as Dukhan on the west of the peninsula and the initial area of oil exploration, which might have given a clue to the woman in the photograph. It is almost certain that the woman has been wrongly identified. If it were Violet Dickson, then her name may have been mis-spelled as ‘Dixon’ as it is likely to have been meant to refer to Violet Dickson, wife of Lt. Col. Harold R.P. Dickson, British Political Agent who was based in Kuwait between 1929 and 1936. Both husband and wife were famous for their travels in the region, their understanding of the Arabs and their writings. Dame Violet, as she later became, lived over sixty years in Kuwait, this continuing after the death of her husband in 1959. However, Zahra Dickson Freeth, who was born in 1925, tells me that this photograph is of neither she nor her mother. 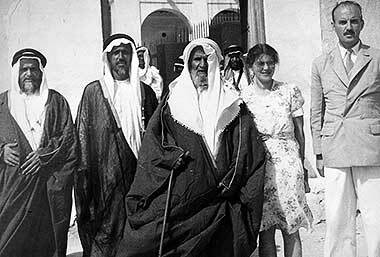 I have now been informed by a correspondent that the woman in the photograph is most likely to be Aziza (Zi) Plant, wife of the British Agent G. Plant, who lived in Qatar between 1950 and 1953. If this is so then the photograph must have been taken within those dates and the two Qatari children are likely to have been born between 1945 and 1948, Sheikh Abdullah bin Jassim being between 70 and 73. Sheikh Abdullah bin Jassim would have been between 70 and 73 then, and the children look as if they would have been born between around 1945 to 1948, though I’m not very good with children’s ages. I don’t know the name or age of Aziza’s daughter. It seems most likely to me that the two Qatari children are not Sheikh Abdullah’s grandchildren but his great-grandchildren for which there are a number of contenders. For instance, Sheikh Abdulaziz bin Ahmad bin Ali bin Abdullah bin Jassim was born about 1946, the son of Sheikh Ahmad, one of the rulers of Qatar. Sheikh Abdulaziz bin Khalifa, older brother of the the last ruler of Qatar, was born in 1948, and would also have been a great-grandchild of Sheikh Abdullah. So it is interesting to speculate who the children are, and whether they are siblings or cousins. While there are a number of photographs on this page that were taken in the 1960s, there are more on one of the Gulf architecture pages.